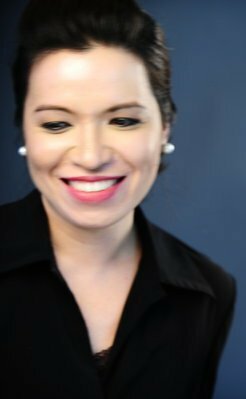 Vanessa Fumar-Gonzales is an attorney specializing in corporate, family and criminal litigation. She is currently a Senior Associate at an Ortigas law firm. She obtained her Law degree from the University of the Philippines and her Communication Arts degree from the Ateneo de Manila University. Before pursuing her legal studies, she was a Desk Editor at ABC 5 News and Public Affairs, where she also dabbled in news writing and reporting. Vanessa has been happily married for almost a decade now, and is a doting mom to a precocious one-year old. I’ve gone to Court almost every day for the past seven years. Call time is often at 8:30 AM, and with a baby demanding my utmost attention, my mornings are almost always tempestuous. I’ve come to accept that while I will never be a “woman of leisure” it will not hurt to look like one. And so, my secret beauty aspiration really is to look formidable but feminine and well-rested. I don’t exactly know how I’ll get there, but I sure can’t be faulted for not trying. I enjoy a long and luxurious bath as much as the next girl. On regular days, I find it more efficient to limit my bath product choices. I alternate between Zen Nutrient’s Gugo Strengthening Shampoo and Conditioner and Organix’s Repairing Awapuhi Ginger Shampoo and Conditioner. I worry about thinning hair and so far, these have effectively kept most strands intact. I’m crossing my fingers they stay that way. For the body, I use Olive You Premium Olive and Castile Soap. This is the one bath soap I can imagine using forever on me and my baby Arie. It’s all natural, gentle on the skin, and smells heavenly. Since I started using it, I noticed that my skin became silky smooth. [My husband the naysayer, already stole one bottle from my stash]. 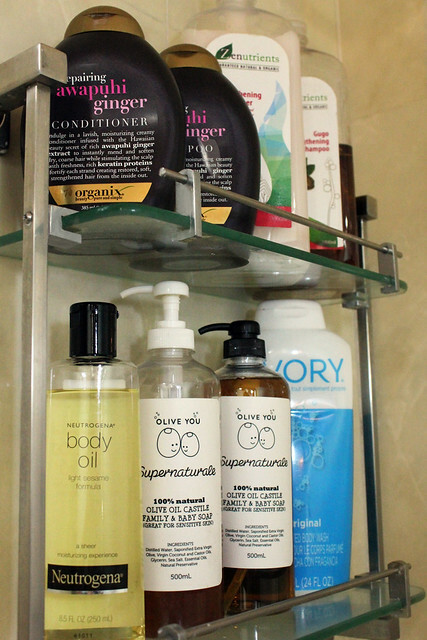 I keep the Ivory Body Wash for days when I temporarily run out of my Olive and Castile fix. Meanwhile, no bath is ever complete without Neutrogena’s Body Oil Light Sesame Formula. It seals in the moisture and acts as “primer” for whatever cologne or perfume I decide to wear after. Skin care has to be simple, straightforward and sustainable for me. If a regimen becomes too complicated, or a product scandalously overpriced, I quickly lose interest. I am forever on the look-out for an all-in-one miracle remedy for my uneven skin-tone, blemishes and aging woes. Until one such “potion” is created, I am fairly contented with VMV’s Oil-Control Line. 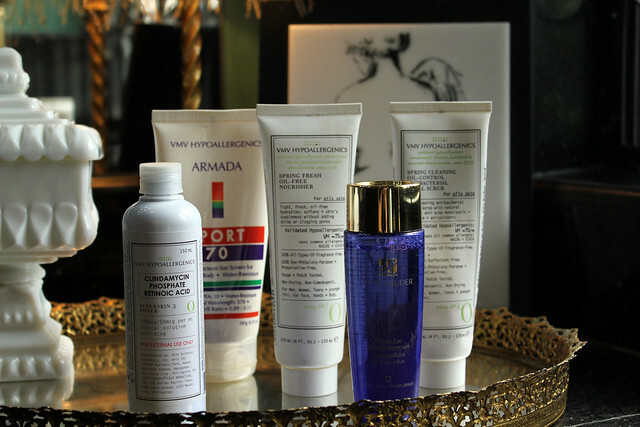 During the day, I start with VMV’s Spring Cleaning Oil Control Antibacterial Facial Scrub. After washing it off with water, I dab a small amount of Clindamycin Phosphate Retinoic Acid, then slather on some Spring Fresh Oil-Free Nourisher . I end with VMV Armada Sport Sunblock, which in my opinion is the best of its kind since it never feels like you have it on. At night, I use Estee Lauder Gentle Eye Make Up Remover to remove traces of make-up and skip the sun block (naturally). Then, I simply repeat my morning routine. So far, this has kept my pimples at bay. Dark spots have also been significantly reduced. On days when I feel that my pores are especially offensive, I use Snoe’s Awesome Poresome Beauty Bar and Microdermabrasion Retexturing Polish. To be honest, Snoe initially caught my attention because of the cute packaging. Then I got reeled in by the delicious scent and friendly price point. I stayed because some of their products actually work on me. 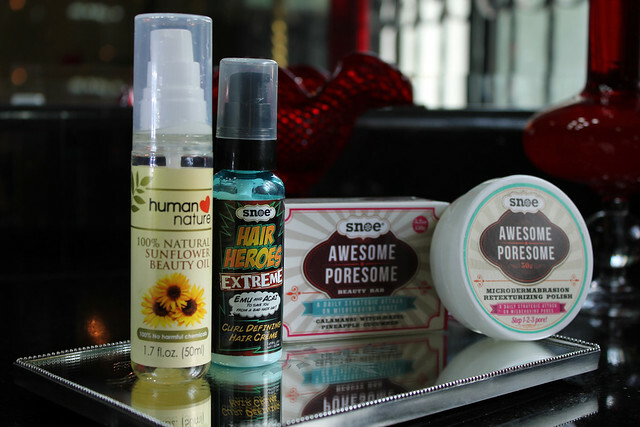 Whenever something feels dry and flaky, I apply Human Nature Sunflower Beauty Oil liberally on the affected area. Works like a charm every time. I am slightly (ok, very) envious of girls who roll out of bed ready to face the world. Since I am not one of them, I acknowledge that I do need a bit of help from trusted beauty brands. I went through a large part of my life wearing foundation that was either one shade lighter or darker than my actual skin color. Thankfully, I had the good sense to enrol in a make-up class one weekend. My teacher told that I was definitely a MAC Studio Fix in NC 35. She was right. Finally, my face matches the rest of my body. To smooth everything out, I apply a thin layer of Benefit’s Porefessional. 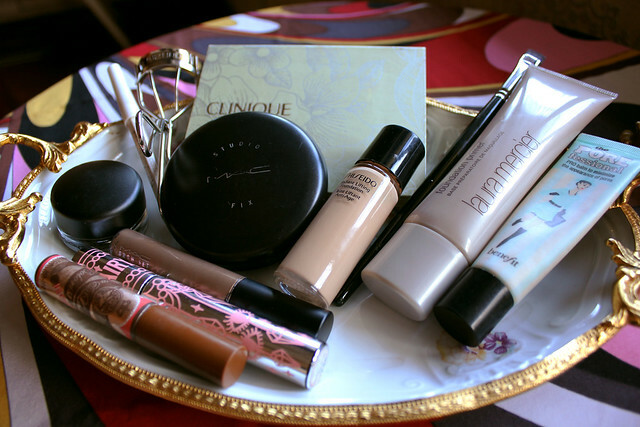 When I need extra coverage, I use Laura Mercier Primer and Shisheido Radiant Lifting Liquid Foundation (040) in lieu of MAC and Benefit. I do not particularly care for powdered blush since they don’t last very long on me anyway. I normally use the Body Shop Lip and Cheek Stain, but I ran out. So far, the one by Snoe has been a decent substitute. I have my eyebrows groomed professionally. For every day, I use Shisheido Eyebrow Pencil in brown to fill in the spaces. For more formal occasions, I apply MAC Brow Set Gel (Beguile) with a light hand, to achieve the “much coveted” arch. A less expensive alternative is Majolica Majorca Brow and Lash Colorist (BR555), which I also love. I do not own a single palette because I have come to the foregone conclusion that eye shadow makes me look tired. I just line my upper eyelid with MAC Paint Pot (Blackground) to add a bit of drama (which we all need in small doses). Maybelline Hyper Glossy Liquid Liner in black also does the job for a fraction of the cost. I swear by Shisheido Eyelash Curler for girly lashes that last for hours. Meanwhile, the only mascara that does not run on me is Fairy Drops Platinum. 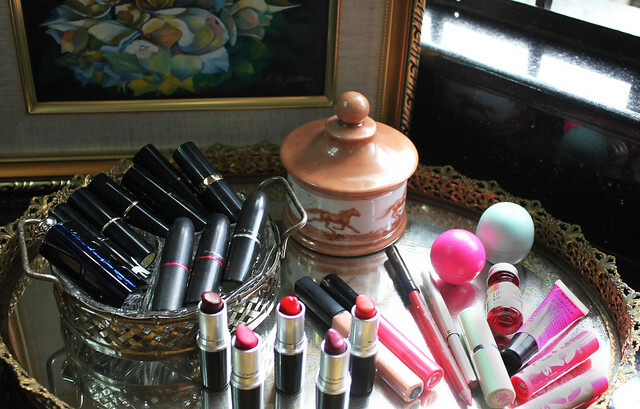 When it comes to lip color, I do not discriminate against brands. I had a bad habit of accumulating them faster than I could consume them, until one of our clients, (a product engineer at a cosmetics company), told me that “old” lipstick can be lethal. I have yet to verify this information, but that abruptly put a stop to my hoarding. I now only keep a modest collection. I am partial to MAC for matte shades. My top 3 favorites are – All Fired Up (for that hint of fuschia), Lady Danger (for a touch of orange), and always, always Russian Red. The only “glossy” lipstick that actually looks good on me is Shu Uemura’s Spiky Rose (not in the photograph since I misplaced it). I read somewhere that your scent has a lot to do with how “young” you are perceived. Since I want to be thought of as forever youthful, I revisit the scents of my past (and I mean distant past) for everyday use– Gotas De Oro, Benetton Paradiso Inferno (an oldie but goodie), Bath and Body Work’s White Tea and Ginger and Grapefruit and Peppermint. Elizabeth Arden Green Tea is also a keeper. 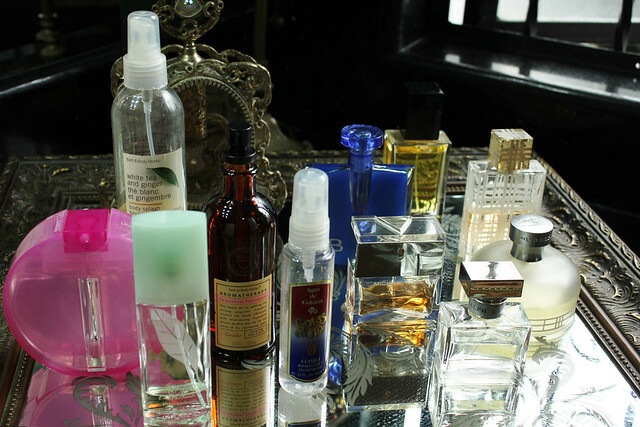 I honestly do not purchase perfumes since I often get them as gifts. I just use whatever is given to me provided the scent isn’t too overpowering or too matronly (not that there is anything wrong with being matronly, but I know you know what I mean). Subscribe to comments with RSS or TrackBack to 'Glossy features Vanessa Fumar-Gonzales'. hi! where can I buy the Olive You Premium Olive and Castile Soap? Where is Olive You supernaturals available in Manila? Thank you! Olive You Supernaturale for me is the best body soap out there which has made my skin soft and smooth like never before. I have extremely dry skin and have never left home without slathering on body lotion. But with Olive You I could now do without that. I’ve also tried high quality olive oil soaps from Turkey and Greece but they don’t quite compare to Olive You. Many can relate! To be effective mom, wife, lawyer (!) and to look good and effortless about it all. Thanks, taking notes on your list of must-haves — very informative! I love that Vanessa mixes high end with local products and appreciate how she knows and accepts herself, what works on her and what doesn’t. This inspires me to look at my stash of beauty and personal care products and once and for all be honest with what’s hiyang with me.